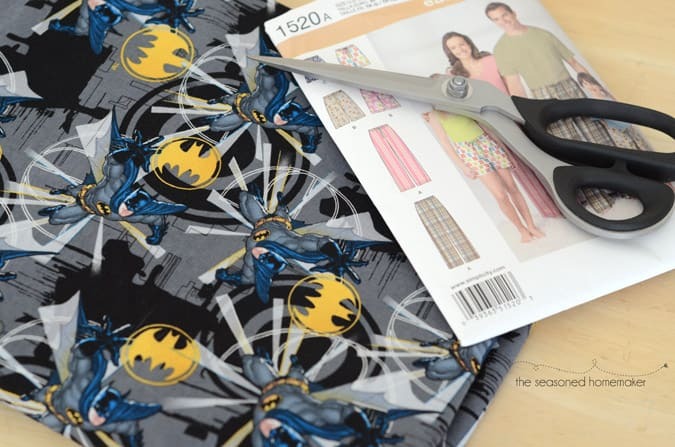 Sewing a pair of Pajama Pants is one of the easiest projects out there ~ especially for new sewists. 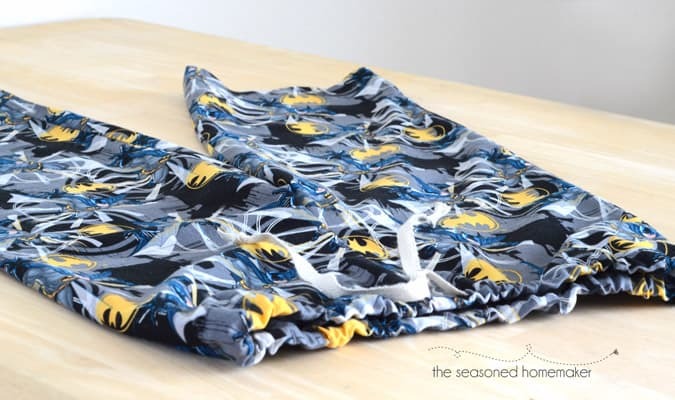 For this tutorial I’ve taken an inexpensive Simplicity pattern (Note: Current pattern #2290) that I picked up at Joann’s for $.99 and translated some of the sewing jargon in order to show you how to whip up a pair or two of Pajama Pants. This is a simple pattern that is sized for kids and adults. 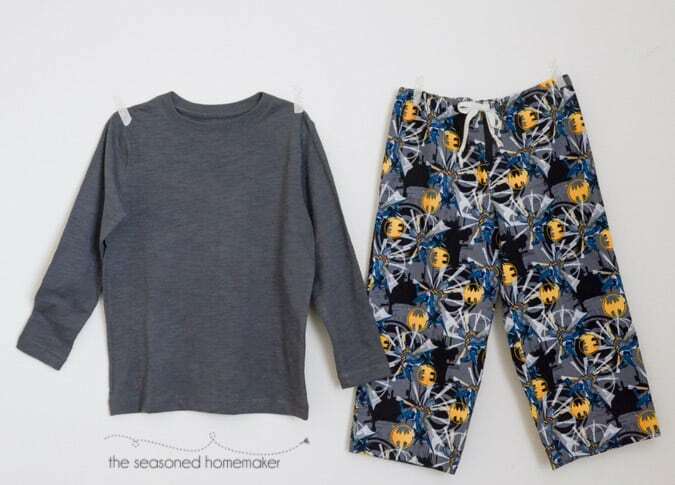 And, it is perfect if you want to learn How to Sew Pajama Pants for everyone in your family. So, first things first. 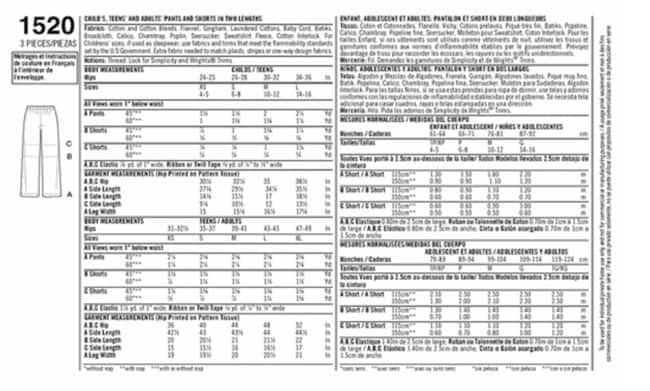 If you are new to sewing then you may not be aware that you can occasionally purchase patterns at Joann’s for $.99. 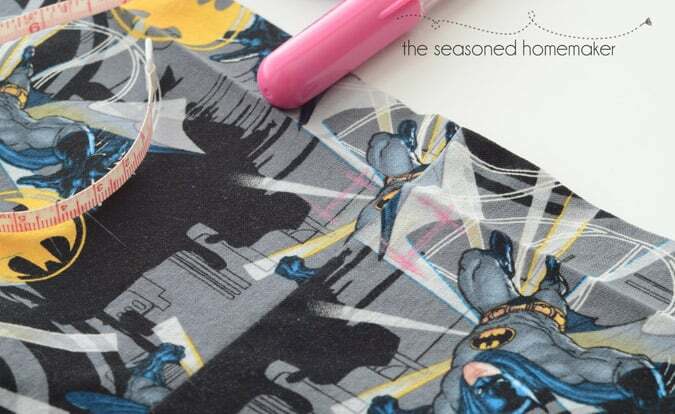 A couple of months back I saw this Batman fabric that I thought would make really cute pajama pants for my two Batman-obsessed grandsons. 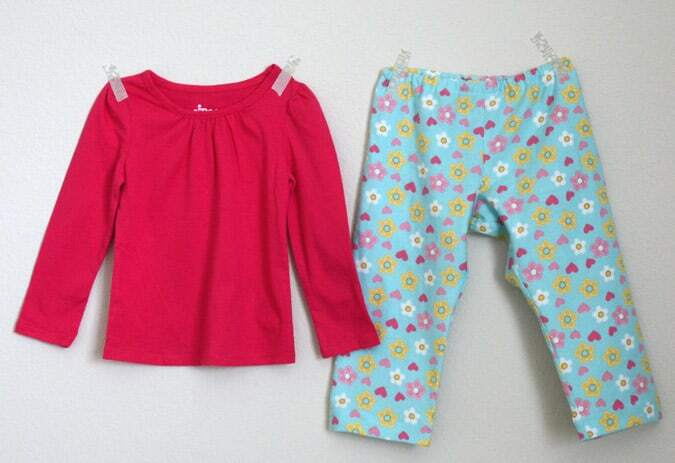 After a quick online search, I found a pattern (Simplicity 1520) that is sized for both kids and adults. I patiently waited until Joann’s had their next $.99 Simplicity pattern sale and picked up the pattern. And, I might add, this is a great staple pattern to have on hand if you do a lot of birthday or holiday gifts. Here’s the thing with pajama pants. 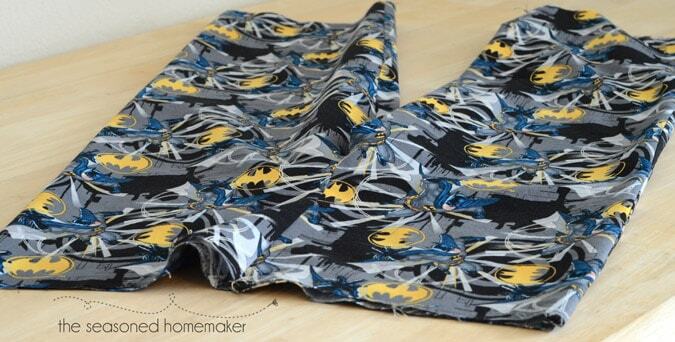 You can take the cheesiest, most gaudy, theme-centered fabric and turn it into a pair of one-of-a-kind pajama pants. It would be impossible not to find something for everyone on your gift list. Literally. For something simple like pajama pants, I think it is easier to start with a basic pattern. There are only two pattern pieces you have to work with. Notice the back of the pattern. It comes in four sizes for children, five sizes for teens/adults AND the pattern is marked for shorts, capris, and pants. All for $.99 ~ quite a bargain if you think about it. There’s really not much to cutting out the PJ Pants. You are cutting out two Front and two Backs. Once the pattern is cut out I strongly suggest that you label the Front and Back pieces with some sort of removable sewing marker. The next step is to sew the inner leg seam(s). Translated, that means pin a Fronts and Back right sides together at the inner leg seam, then stitch. Repeat with the other Front and Back. Notice how the Front and Back are a little different. The back is cut a little deeper in the crotch to allow for sitting. It also has a little more rise in the back. 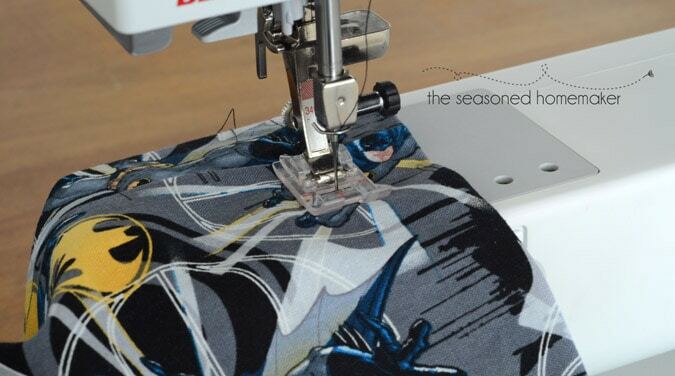 With RIGHT sides together, pin center seam, matching inner leg seams and notches. Stitch. What they really want you to do is open up the pieces that you just stitched together on the Inner Leg Seams. Then, press them well so the seam is nice and flat. Next, with your fabric right sides together match up those Inner Leg seams. This will be shaped like a the letter U. Pin this together then stitch. How easy is that. No colorful language and sewing desire still intact. This step is pretty straight forward. With right sides together match up the two side seams and pin. It should now look like a pair of pants. Stitch the front to the back at the side seams. 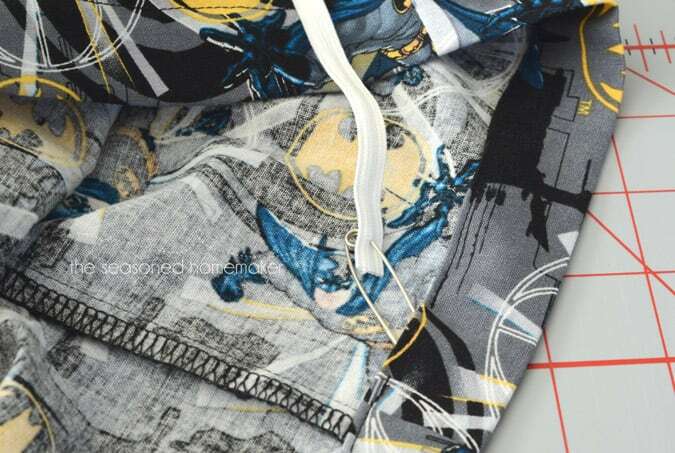 Press open the seams and then turn the pajama pants inside out. Here, I’d like to mention seam finishes. 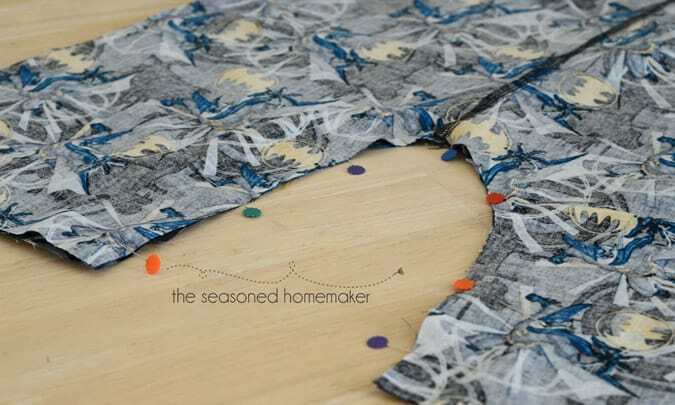 Notice how I have used a serger to finish my seams. 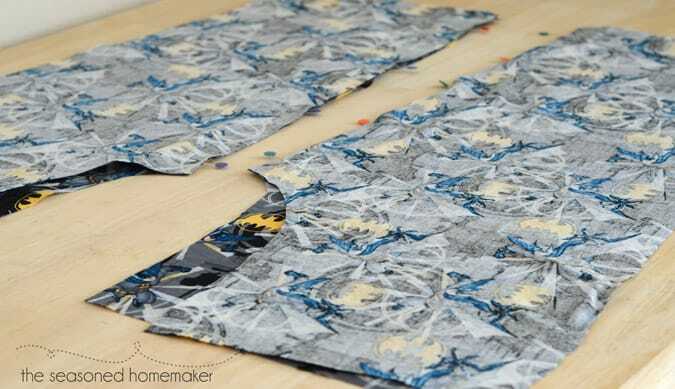 I know many people don’t own sergers; however, I have a tutorial on How to Finish Seams without a Serger. This is an additional step that is not a part of the pattern directions and is completely optional. When I sew pajama pants I like my elastic to be pretty loose for comfort. In order to tighten the waist a bit I add in a tie. This way I can be comfortable and keep my PJ pants from falling off. I like to use twill tape for my ties. (affiliate) To determine the size of the buttonholes, measure the twill tape that you plan to use and size your buttonholes accordingly. You can always make your own tie using the leftover fabric. 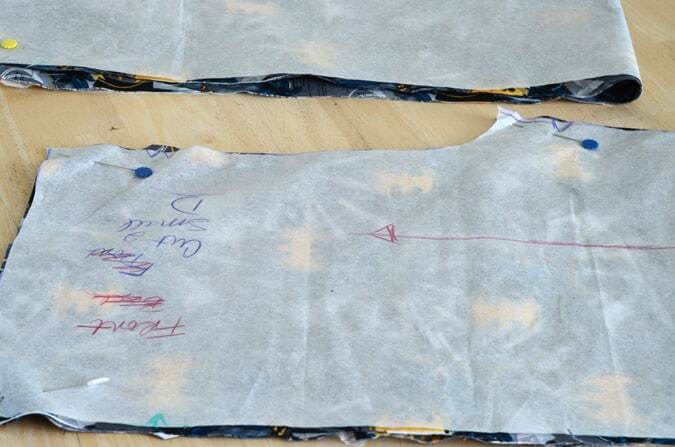 Here are the directions on How to Make Bias Tape if you want to make matching ties. 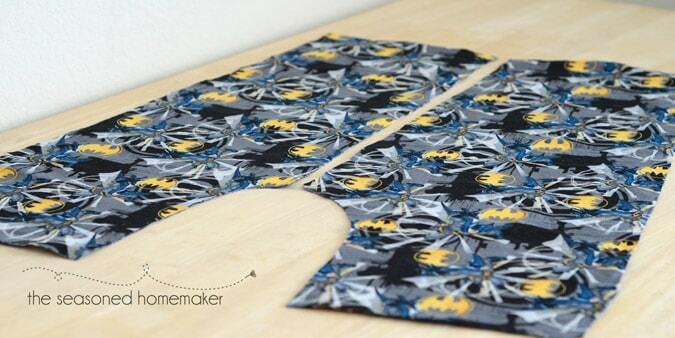 In order to add a tie you will need to add two buttonholes on either side of the pajama pants front seam. Notice how I’ve unfolded my casing. I will be making the buttonholes only on the front of the pants BEFORE I sew down my elastic casing. For more information, I have a tutorial on making the perfect buttonhole. Before you sew the buttonholes I strongly encourage you to stabilize the back of your buttonholes with a small piece of tear away stabilizer. This will keep your buttonholes from bunching up and tunneling. AFTER you’ve completed your (optional) buttonholes then you will want to stitch down your elastic casing. Be sure to leave an opening to insert the elastic and twill tape. The instructions say to cut a piece of elastic the length of the Elastic Guide. Exactly, how does the Elastic Guide know the correct waist measurement? There is a better way to get this measurement. 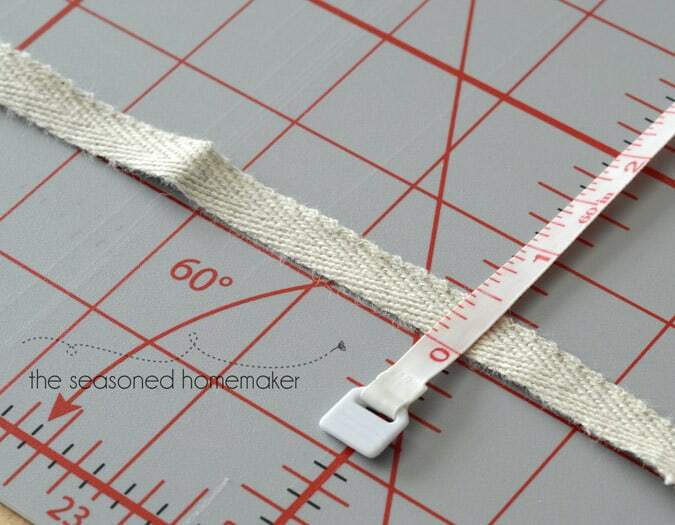 Measure 1″ below the waist of the wearer of the pajama pants and cut a piece of elastic 1″ larger than that measurement. 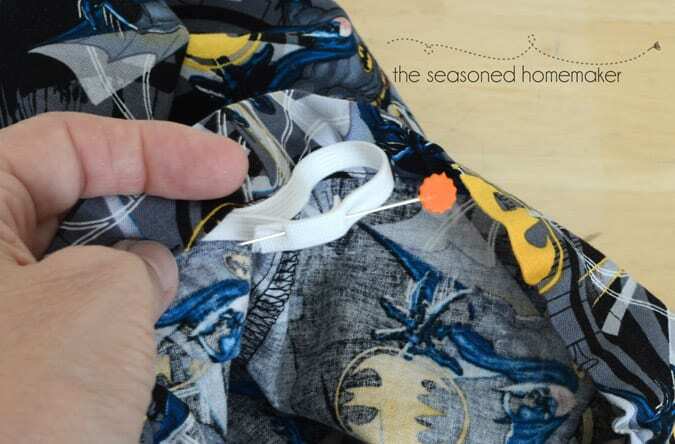 Using a large safety pin, insert the elastic into the casing and thread the elastic all the way around the casing until it comes out the other side. Adjust the elastic gathers evenly around the waist. Note: I recommend getting Pajama Elastic which is softer and less constricting than regular elastic. Overlap the elastic about 1″ and pin. Then carefully stitch it down using a zigzag stitch. Once the elastic is evenly distributed you can sew the opening closed. 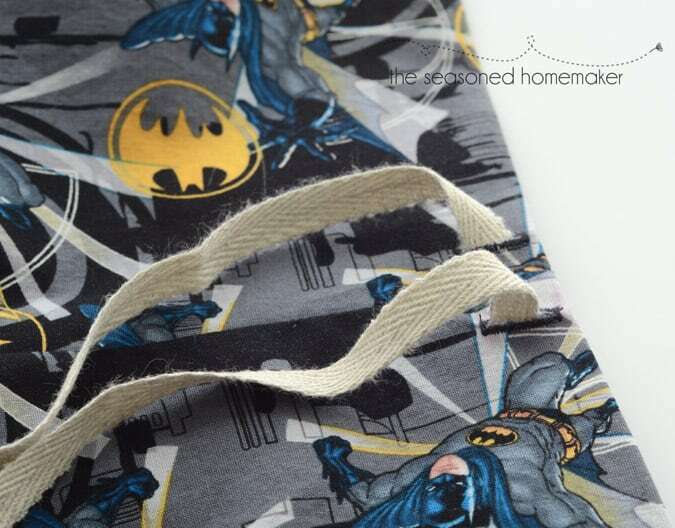 Now you can thread your twill tape through the two buttonholes in the front of the pajama pants. The final step is to hem the pajama pants. You will need the waist-to-floor measurement of the person who will be wearing the pajama pants. Mark the length and turn under just like you did for the elastic casing. 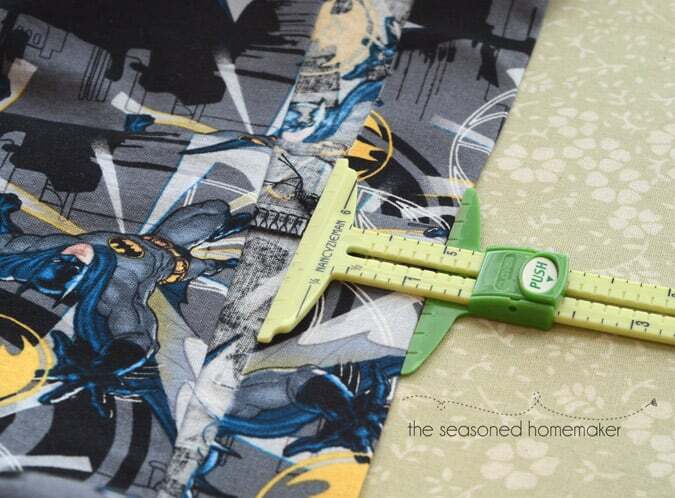 Trim away any excess until the hem allowance is 1 1/2″. 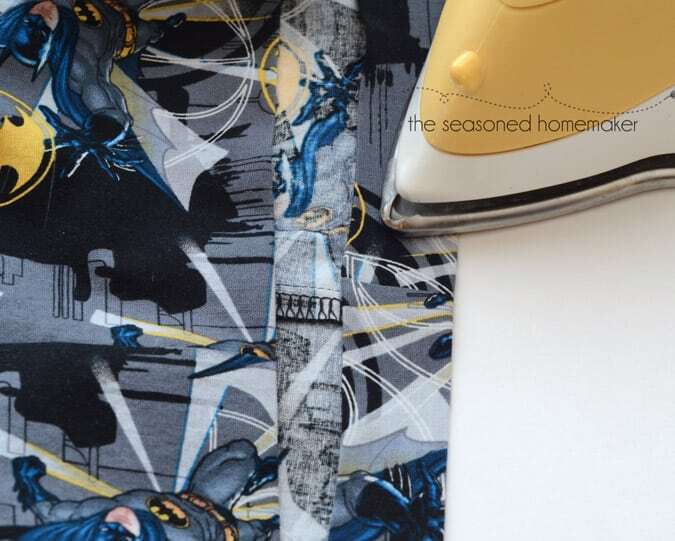 Fold under the raw edge 1/4″ and press. Stitch close to the pressed under edge. And you are done! Now for the best part. 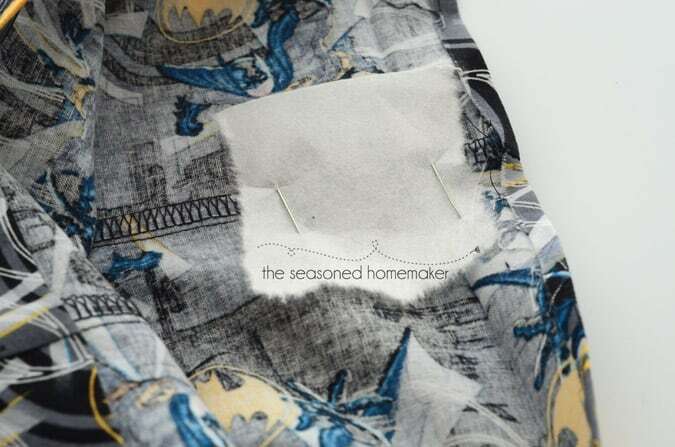 After you’ve made a pair or two you can whip these up in about 30 minutes ~ and that includes adding two buttonholes! On this pair of Pajama Pants I eliminated the tie because they are for a child who is under age 2. I wouldn’t add a tie to pants for any child who is under age 4. Now, I’m off to sew several more pairs. Pair these pajama pants with an inexpensive t-shirt from Target or Walmart and you’ve got a nice personalized gift.